Planned road trips can add a little more fun, excitement, history and enjoyment to a vacation. We all have experienced the normal routine of getting to travel destinations. Hurried preparation, hurried travel, boredom, stress and more of the same is expected. It doesn't have to be that way and in fact it shouldn't be that way because getting there should be half the fun. Family Vacations Hidden Gems has a list of fun road trip games and activities. America is between here and there, or from your home to Branson. Unusual places, good restaurants, nice motels, historical markers and sites, scenery and most of all good people who make it a priority to cater to the traveler. It is said that the anticipation of a vacation is half the fun but travel is a key part of your Branson vacation. Whether you're taking a family fun vacation, a Branson romantic getaway or one of your weekend vacations the trip should be a part of the enjoyment. Before you leave though, prepare for your Branson vacation by checking our pages of Branson lodging. 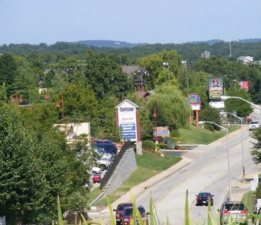 The accommodations in Branson, Missouri are varied and will fill the needs and desires of any traveler. You will find Branson lodging cabins, Branson Motels, Hotels, Beautiful Branson Bed and Breakfast Inns, fishing resorts, golf and luxury resorts, campgrounds and Branson RV parks. Our pages give you a good idea of the type of lodging available so that you can make a decision on the place you want as your home during your Branson stay. Make your reservation so everything is set up when you arrive. Check the different Branson activities and theaters that you want to visit. If these are mostly in the same area you might take that into consideration when making your lodging choices. This saves time and money, but don't be too concerned because getting around the Branson area is easier than you might think. You can usually get theater tickets when you get to Branson but if you want to make sure you get the best seats or a specific type of seat call ahead and make reservations. You can pick up the tickets when you get to Branson or if you have time they can mail them to you. Don't hesitate to ask if there are discounts available. If not, ask if they will take coupons when you arrive and credit your ticket price. Coupon books are available throughout the Branson area that can reduce ticket prices by $1 to $5. If you plan to spend quite a bit of time at Silver Dollar City or if you will be coming again during the season, you might want to order a 2-day pass or season pass. This will save you some money and you will need more than one day to enjoy all that Silver Dollar City has to offer. Now that you've made reservations and have your destination plans set you need to do the same for your travel. In your road trip vacation planning allow enough time for the trip. A hurried trip creates stress and can set the mood of your vacation. Keeping your speed down also eliminates stress and will save gas. Traveling in Missouri you'll find gas prices to be well below the national average and the Springfield area is usually one of the lowest areas in the state. Your planning should begin well in advance and include a checklist. Use a road trip map or computer map to plan your route and establish the road trip directions that you will be taking. Use a travel guide. If you are taking a route to Branson that is covered by Branson-roadtrip.com, you can print the pages. These give you valuable information about things to do or see as well as some basic travel information. If your travel is more than a day make motel reservations and decide what restaurants along the route you may want to visit. Prepare your vehicle by getting it serviced and inspected. We recommend joining an auto club or RV travel club such as AAA (American Automobile Association). The annual membership is minimal compared to the cost of services and peace of mind it provides. Games for a road trip. You can bring games that play well in a vehicle, make up games using billboards or find some funny road signs. Photography can be fun and create great memories. You can create a photo album or use the photos as part of complete road trip album with written memories. Take along some snacks to save money. Packing some road trip food in a cooler and taking a road trip grill will allow you to save money and enjoy a nice picnic along the way. These items come in handy while you are in Branson since there are many places such as the lake to have a nice picnic. These are just a few road trip suggestions. This planning will serve you well and eliminate those "I forgot to bring" moments. Preparation is the best insurance for some fun road trips. Whether you're traveling by motorcycle, RV or car the very freedom of the road is what makes the highway so special. The family vacation is as American as baseball and apple pie. And it doesn't have to be expensive, cheap road trips can be just as much fun. If you are planning a camping trip we'll speak on some camping necessities on other pages. You may even find some great ideas on pages about necessities or helpful items for stays at motels, hotels and resorts. Driving has always been the primary mode of transportation into Branson even for those living some distance away. License plates from New York, California, Michigan, the Carolinas and even Alaska are not that uncommon. The new Branson Airport opens up new convenient possibilities for many people but the highway will always be the preferred option for many people. The possibilities for travel pages from all points of the country would seem almost endless but we'll begin with routes from some major cities within a 500 mile radius of Branson. Many travelers will go through one of these cities at some point in their travels. We hope you will join us as we build these pages. Our KC to Branson page will bring you through central Missouri as the plains give way to the Ozark Mountain region. If you are flying into Kansas City and renting a car you can check our KCI Route page for the best options for getting to our KC to Branson starting point. At Springfield there are alternate routes that take you around or through the city and two routes that will take you to Branson and the lakes. Our main page for each road trip will take you on the most efficient and easy route around Springfield to Branson. Our Springfield alternate roads page will provide the various routes through Springfield and the alternate route to Branson and the lakes. From Tulsa there are several possibilities but we will take you on two. Tulsa to Branson is a fast easy route on the interstate and Tulsa Route 66 is a trip through history. Dallas to Branson is open to some good possibilities for 2-lane travel but our main page will show the common route. Wichita to Branson is a drive through small town America where you can pick up either Route 66 or I-44 just west of Joplin. If you coming from Little Rock-Branson your drive is through the gorgeous Arkansas Mountains on Hwy 65 and across the great Buffalo River. This is beautiful country with some great scenery and unique stops. Bring your camera. Hot Springs to Branson is one of the prettiest scenic routes you'll ever take. Most of the time the changes in terrain are gradual but crossing the Black River north of Jonesboro on your Memphis to Branson trip is an immediate change from the cotton field to the mountains. Nashville to Branson will take you on Missouri's Hwy 60 through parts of the Mark Twain Forest. If you like river fishing or float trips you may want to allot an extra day for a stop in this region. 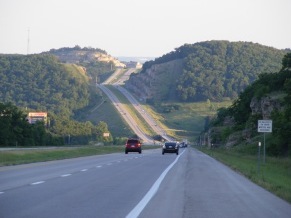 St. Louis to Branson through the northern part of the Ozark Mountain Region is a great route. This is a great drive and can be even more unique if you take the St. Louis Route 66 route. Stay with us as we create these wonderful road trips to one of the best vacation destination in America.